So here we are at our third installment of deal finding. This one unfortunately will only be of interest to a smaller group of people. However, most of these ideas have more than just homeschooling supplies. Often it will include books in general for kids, art supplies, science projects and other hands on learning activities! 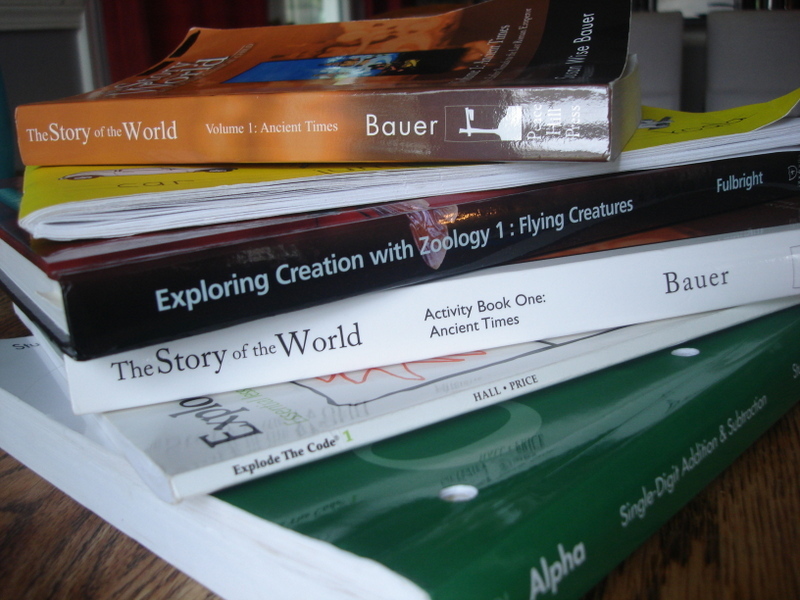 This year before I purchased any of my curriculum for Tonchi I spent a lot of time reading other homeschooling blogs for ideas on what books I would like and would suit Tonchi’s needs. Putting the time and research in ahead of time saves money so that you don’t purchase books that you don’t need or won’t use. Once I had an outline of the subjects we wanted to cover and what books I wanted I first figured out what we could borrow from friends or the library. If there were reference books that the library had available for loan then I just planned on getting them there. Part of our school schedule is to go to the library once a month. Again this takes planning and foresight to know what books you need to pick up and putting them on hold ahead of time to make sure they are there. It does work though and it has saved us lots by not having to purchase and store all those wonderful books! My next list included the books that I needed to purchase. I joined a homeschool support group close to us and they have a great functioning classifies email chain. Probably about 3-4 times a week an email comes through with books people are selling or services they are aware of for homeschoolers or that they are offering themselves. It does take some time to look through the list, but I purchased probably about ½ of our needs for this year from this group. They also have a large used curriculum sale usually in June/July time frame. I also have happened upon some great finds there as well. I’m also a part of the Sharenet homeschool email network, which is basically just an email that comes out monthly with opportunities for classes, curriculum sales, services, field trips and lots of other great stuff available to homeschoolers. Some people list books for sale here and also other large curriculum sales as well. A blog/website I use frequently is Free Homeschool Deals. By getting on their email list you will receive weekly emails with free printouts, ebooks, lapbooks and more. Usually these are limited time offers so they change frequently. I’ve found lots of great seasonal crafts, stories and unit studies this way. You could probably design a whole years worth of schooling from free stuff if you took the time by using this site! I also like to monitor Educents for good deals as well. Tonchi really likes the [amazon_link id=”0963930710″ target=”_blank” container=”” container_class=”” ]Draw.Write.Now[/amazon_link] series and I have the first book, but the whole set (10 books) costs $75 and I just don’t have the money for it. I saw it on Educents a month or two ago for $50 and I’m still wishing I would have gotten it! Oh! Well! I can just hope it comes again! This site changes frequently too as to what deals they are offering. Homeschool Buyers Co-op is another site I’ve looked at, but I’ve never ordered anything through them. They basically get discounted prices through bulk ordering. So they talk to the distributors and get deals for large purchases and then offer it to the co-op for a cheaper cost. It’s free to join. I’ve found Rainbow Resource Center to be the best place to purchase new books. I’ve compared them to Amazon and ebay and a few other places. This is my last resort if I can’t find what I need used or discounted. These prices are also discounted, but not quite as much as some of the other resources listed above. This company also offers lots more than just books, but hands on teaching materials, craft materials, toys, games and much more. I’m sure I could come up with more, but this is all I can think of for now. Also since Tonchi is only in the 1st grade I’m sure the more practice I have the more I will be able to locate a deal! If you have ideas or favorites of yours I’d love to hear! Please share! This post is super helpful for me, especially as Tonchi is only a year ahead of Desmond. Thanks for the tips, sounds like you have some great connections! I’m so glad. I’m happy to talk homeschool plans anytime! In fact, I was just thinking I needed to start planning for next year!